This is the 'Annual Report' issue of the newsletter, and this year there is quite a bit to report, although not all of it is good news! It seems as though there will have to be some changes to my methods over the next few months; you can read more about it inside! We'll of course have another column in the Sadako's Corner series, but that's about all we'll have room for this time. Last year was a 'light' year for me in the media. For the first time in many years, I made no TV appearances at all, although NHK was good to me with a radio interview on a popular program near the end of the year. 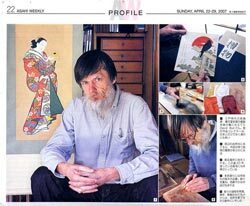 The Asahi Weekly is a tabloid size paper aimed at Japanese who wish to improve their English skills. 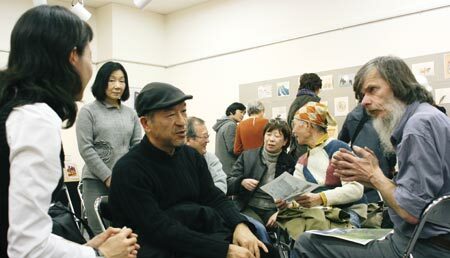 They frequently run stories on foreigners living in Japan, and this time it was my turn. It's rare for me to give interviews in English these days! Quote: "My new 'My Solitudes' project consists of prints of three places (a riverbank, a forest, a sea coast) during the four seasons of the year. These woodblock prints will be published in editions of 12 fine-printed and bound books, featuring stories of his experiences in Mother Nature as well. "It is incredible," David said. "There are these absolutely quiet remote places right in Tokyo where you don't meet a soul and the hectic city life seems far away. Sitting quietly in front of my tent, I am never bored. "So much is happening there: a hawk catches a fish only meters away, birds are singing, insects are crawling all over the place, and at night, the many different sounds of the river sound like one fantastic orchestra." 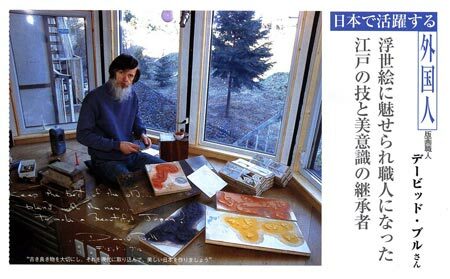 This is the 'other way around' from the previous clipping - Monthly Nihongo is a specialist magazine produced for people who are teachers of Japanese. 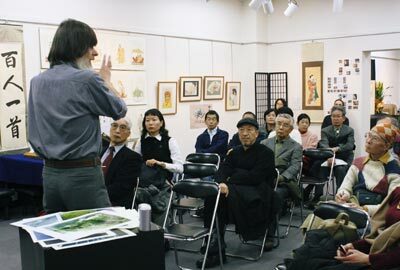 But people living bi-cultural lives are of interest to them too, and they particularly wanted to know what I found attractive about Japanese culture. This is a magazine published by a research council, and aimed at corporate business leaders. Full of stories about modern life and current trends, they still find it interesting to write about someone working with old traditions, as I do! Quote: "It has now become very difficult to obtain beautiful 'washi' as well as it used to be made, or a baren made from bamboo. But I'll continue to try and create the best prints I can, using what is available. Why? Because Japanese traditional prints are the most beautiful in the world!" Each year in the spring issue of the newsletter, it is usual for me to include a few 'Report' type stories - one on recent media coverage, one describing the annual exhibition that was held in January, and one reporting on the previous year's business results. You've already seen the first of those, but for the other two, it seems perhaps better to combine them this time. It's not that there is nothing to report on those two topics - it's that the reports can be summed up very concisely: both the exhibition, and last year's business, were pretty much a disaster. The exhibition was the nineteenth annual event, but the first one in which no new subscribers at all asked to collect my prints. Luckily, a half-dozen previous subscribers came to the show and let me know they would like to join the new series, and a couple of former collectors also placed orders for back-number prints, so I did not come home at the end of the week totally empty-handed, but there is no question that it was quite a disappointment. The problem - again - was lack of publicity. For the past four or five years now, I have pretty much struck out with the media at exhibition time. Any number of times during the year I get magazine stories, or chances to appear on TV programs, but these don't bring in new collectors. For that, I need crowds at the exhibitions, and the only way to bring in crowds is to get enthusiastic media coverage. It is of course totally out of the question financially for me to purchase advertising for the exhibition, so all I can do is send out plenty of promotional material to media outlets, and then hope that they will 'bite' and cover the event. But as I said, this year again I received next to no coverage, so the gallery was mostly deserted through the week. The opening Sunday was an exception, as this is the day that many of the regular collectors come, and it was very enjoyable. Surrounded by supporters; challenged by questions; if only every day could be like that! The room in the Kotsu Kaikan costs just about 9,000 yen per hour to rent, so the rest of the (very quiet) week was a fairly frustrating time, highlighted only by the occasional visit from one of the collectors or supporters. After getting home from Yurakucho and cleaning everything up, the next job waiting for me was to finish the bookkeeping from the previous year, in order to prepare for filing my tax return. After a number of very successful years following the completion of the long Hyakunin Isshu series, my print sales income has gone into freefall, and the numbers for this past year have been nearly identical to those for 1993, about which I wrote in this newsletter 14 years ago, "It has been a long and difficult year." This chart shows the details; sales income was far lower than the previous couple of years, and was completely wiped out by business expenses, taxes and insurance. As you can see from the bottom line, I myself had no effective income during the year, and only managed to pay for groceries and suchlike through the constant postponement of paying other bills. Creditors and helpers have been - for the most part - understanding of the situation, and there has actually been very little stress along the way. At the moment, I have a few unpaid bills on my desk, but nothing dramatic, and other than my quite manageable mortgage (at only 2.3%), I have no debts. But at this point there are obviously two questions that need to be addressed: (1) what has caused this slide? and (2) what am I going to do about reversing it? The first question is easily answered. During the years of steady income on that graph, I was making prints that were of interest to many potential collectors, and which were within my ability to get out the door on a reasonable schedule. This 'slump' began two years ago when I took on the scroll project, which fit neither of those two criteria. I suspected when I took it on that it was 'not for everybody', and I was right. I suspected that it would be a difficult project to complete, and I was right. Looking back now, it was perhaps not the best idea to immediately follow that complex project with one even more difficult and complex - the 'My Solitudes' series. Perhaps 'Hanga Treasure Chest #2' would have been a more practical choice! But what's done is done, there's no backing up, and now here I am, in rather deep water! As things stand at present, the Solitudes series is about 1/3 subscribed; I am making 200 copies of each print, and there are currently 76 subscribers. Based on how long it has taken me to produce the first four prints in the series, it seems as though I should be able to issue another five or so during this coming year. On top of that there will be a smattering of sales of back number print sets, and there are also still some people working their way through collections of the Hyakunin Isshu poetry series. Mokuhankan print sales helped me a great deal this past year, and will hopefully continue to be an important part of the picture. But when I add up all these things, for an estimate of the prospective income for this coming year, things still don't look good. Something has got to change. Well, the thing I would most like to change is the '76 subscribers' that I just mentioned; I'd like it to become '200'. That would solve all the problems! Unfortunately though, that's easier said than done. About all I can do at this point is continue to try and create interesting prints; if I succeed in that, then the prints and books will eventually fly away to find good homes ... but that is for the long term. Another thing that would help a great deal would be an expansion in the Mokuhankan catalogue. There are actually quite a few people who have purchased all the prints there, and who have let me know that they are just waiting for more to appear, so that they can order them! But with neither time to work on such prints myself, nor money with which to order them from other craftsmen, I can't easily move that publishing project forward at present. So what to do? With my days eaten up by the very time-intensive printmaking work, and absolutely no financial resources available for any kind of new investment, how on earth can I improve my situation? Well ... all is not lost! I can indeed identify a few areas that I think can be worked on. The first of these is the Japanese side of my internet website. More than half of last year's income came through internet connections, but almost all of that was from the English side - from overseas. A few years back, purchasing things over the internet was not common in Japan, but that has changed, and many people are now comfortable with using their computers this way. I have not kept up with these changes though, and as a result, am missing out on quite a bit of potential business. So I have spent many long evenings over the past few weeks programming and building a much more useful and attractive Japanese web presence for my prints, including a shopping facility that includes both my own print sets and the individual Mokuhankan prints. 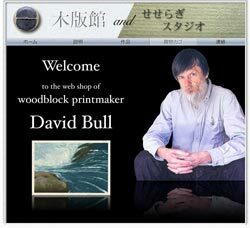 The new website (in Japanese only) can be found at http://mokuhan.com ... a domain name which is the direct translation of woodblock.com, my long-established English site. In addition to the new site itself, I have established a new affiliate program to go along with it (and with my English-language Mokuhankan site also). Anybody with a blog or website of their own can run small ads that I have prepared, and which carry an affiliate code. When a potential customer visits my site after clicking on one of these ads, my software recognizes where they came from, and if this person makes a purchase, I pay a commission fee to the person hosting the ad. It's not very 'big business', but I'm hoping that it can grow bit by bit, and perhaps become an important way to help bring more visitors to the site. Now these improvements are all very well, but they can only help put food on my table if they are successful at moving prints out of my storage drawers! And some of my drawers are so full! 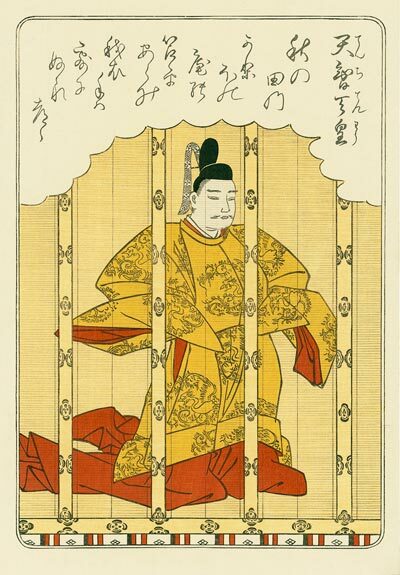 In the years immediately following the completion of the Hyakunin Isshu poets series, I did a complete re-printing of the entire set, and - as I mentioned above - some people are collecting these one by one. But it has been many years now since I received any new orders for these prints, and it has become painfully obvious that my policy of accepting orders only for the complete set of 100 is completely impractical. I like making beautiful prints, but if they just end up sitting in my drawers, then there isn't much point. So, after quite a bit of internal debate, I have decided to open up that series, and let people select their favourite poets. Here's how it will work: the prints will be available as singles, in sets of ten, or of course as a complete set of 100. - single prints are mounted on stiff paper, packaged in clear envelopes, and will be 20,000 yen each. - sets of 10 have the prints mounted in acid-free folders and stored in a latched case with slip cover. I created 10 such sets, each with a balance of different types: 1 emperor, 2 court ladies, 1 priest, and 6 courtiers (3 standing, 3 seated). The price for each of these sets is 150,000 yen (15,000 per print). If you prefer, you may mix and match the poets to create your own sets - but you must follow my pattern of types: 1/2/1/6 as described above. - of course the full set of 100 poets is still available for purchase. The prints are mounted in acid-free paper folders, in the same latched cases, 10 prints to each case. The price for the set is a million yen (10,000 per print). I think these policies should provide protection for the people who have collected these prints in past years, by not underselling them, and will help finally spread these prints out where they can be enjoyed by as many people as possible. Purchase information for these prints is here. I would like to emphasize that although this story has plenty of 'bad news' about my finances, I am in no way beaten down by my current temporary circumstances! I'm still making a living purely as a printmaker, and when one considers that as a 'new artist' I have in my first year already sold more than 300 of my original prints, I think that is quite a respectable accomplishment. But look at this - I've used up nearly the whole issue talking about money and business, and have said nothing at all about the new prints! Take a look at the back cover of this newsletter to see the latest one ... isn't it beautiful! It seems like 'just the other day' I was bringing you some 'baby news', and here we are again! 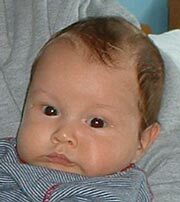 Daughter Himi has been hard at work building her new family, and she gave birth to my second grandson Andrei just a few weeks ago. With Alex still only about 1 1/2 years old, Himi must really have her hands full these days, but she tells me that she is getting good support from husband Ioan and the other people around her. I am looking forward to seeing the little guy sometime, but in the meantime, Himi and I (and other family members) are keeping in touch with frequent internet video phone calls. My own little baby girl now has two babies of her own ... who could have believed such a thing could ever happen! There is one particular incident that always comes to mind when income tax season rolls around, even though it happened many years ago. I overheard a conversation between two women on the other side of a partition in the changing room of a sports club that I attended regularly in those days. Although I couldn't see their faces, the upset voice and rapid speech of one woman and the shorter apparent agreements from the other set the tone. It seems that the tax office had challenged the income figures in the woman's tax report, and she had been required to pay additional taxes. According to her, she was simply unlucky, because it is not really possible to maintain a normal living standard if one declares all one's income honestly. She was in a very bad mood. Is this the way to survive while running a business in Japan? Having no idea about this, I related the episode to David. He became very upset! He insisted strongly that it is our obligation as citizens to pay income tax, and that this woman is shameless. In my own case, our families' taxes were always deducted at source, so - luckily or unluckily - I have no knowledge of tax evasion. But as I sometimes see people ask for official receipts at the supermarket, for food being purchased obviously for family use, I wonder what is 'normal' when it comes to income declaration. Dave angrily continued, and said that because he always declares his income right to the penny, he is always ready - even eager - for a visit from the tax office. But this leads to a question - when we look at his financial report it seems that there is no way he could possibly be surviving other than by eating and drinking 'air'! What's going on? He smiled and explained that he recently is only able to survive by the constant postponement of paying the bills to his helper and other suppliers. Because we are so close, I feel a bit proud that he is able to make do, but at the same time, honestly have mixed feelings about this; aren't there even a few more expenses he could deduct from income to help reduce his tax burden? And it makes me think about my own views - how would I behave if I were in his position? Well, there would be no other option than to do pretty much exactly the same thing - but for different reasons. My honesty comes not from any sense of justice, but from timidity! If I were to cheat, I would be in constant fear of having my crime discovered! It would be an unbearable situation! Those who cheat society of millions on their taxes ... how 'courageous' they are! For this print, I tried something I have never done before - I put aside my delicate carving tools and used a V-gouge - a tool that was never used back in the era of traditional printmaking. I wanted to try and create a vivid feeling of flowing water by using this tool to gouge slashes in the woodblocks. I think the experiment was successful; this water looks good enough to jump in! "My camping spot hasn't changed since I was here a couple of months ago. Seen from a distance, this riffle area of the river looks quite gentle, gurgling along as it tumbles over the gravel, but when you come close and stand at the edge of the stream, you see more of the violent interaction between water and rock. Just a couple of meters in front of me, there are a couple of rocks out in the river, one of them open to the air, the other just under the surface, with a thin layer of completely transparent water streaming over it. 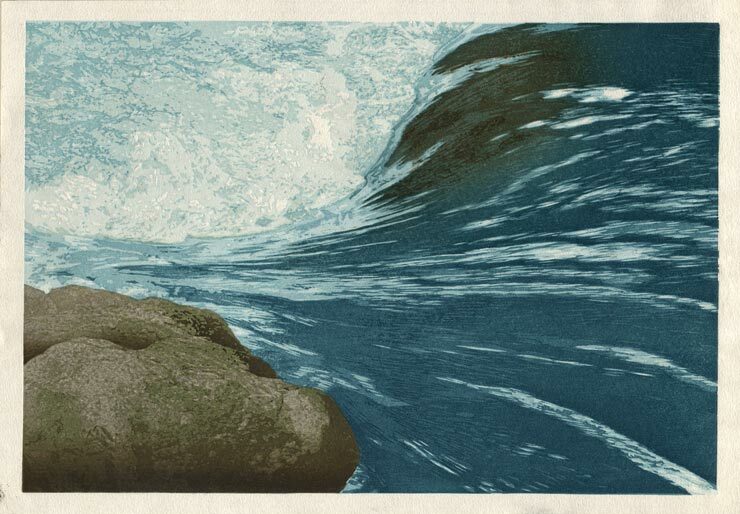 Between them, the water swooshes down a chute and dissolves in a cascade of foam."